Today’s post is dedicated to the lost, heartbroken and the stressed. I’ve been there. I’ve done that, and in some ways I’ve written a book about it. We don’t share the same situations and experiences, but we all go through it. It’s called life. And sometimes you have to be reminded of it. I know you’re tired of hearing, “this too shall pass” or “you’re going to be fine”. So I’m going to send you a different message. Lost your job? (It wasn’t for you.) Making sense of a recent loss? (You’re not in control.) Breaking up with a spouse or friend or group of people who just don’t get or want your awesomeness? (It’s their loss.) Don’t stop, my friend. This crazy uncomfortable place is the beauty of life. Didn’t you know? We aren’t supposed to know all that’s ahead of us. That’s the ‘remarkableness’ (yes, that’s a word) of a long run down interesting back roads. Soak up being in the great wilderness of change and uncertainty. Straight paths, like ‘dreadmills’ are for the boring, uninteresting and sheltered. Curves in the road make your journey unique, interesting, and rewarding. And just when the whole weight of the world feels like it’s breathing down your back, stop yourself. It doesn’t have to. It’s your choice. It’s your marathon, at your pace. 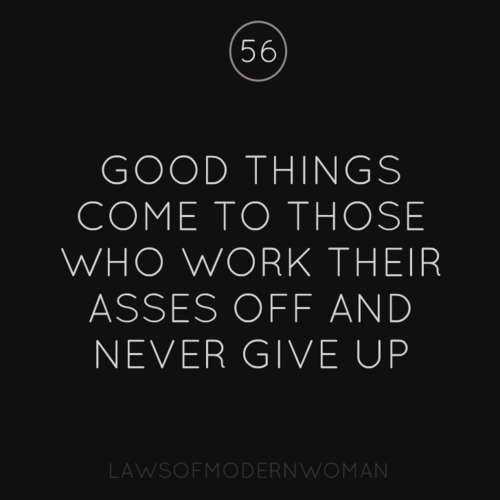 Good things come to those who work their asses off and never give up.